GODSMACK has selected "What's Next?" as the next single from its sixth studio album, "1000hp". A video for the track will be released soon. 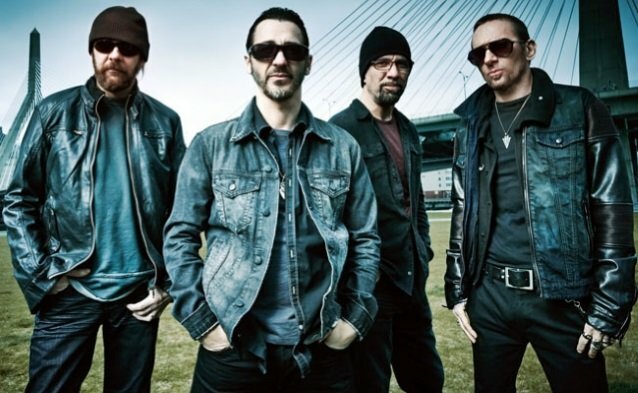 Speaking to the K-Rock radio station in Syracuse, New York earlier this week, GODSMACK frontman Sully Erna stated about "What's Next?" (see video below): "We had a small problem with the label that they kind of went behind our back and they decided to just go choose a single ['FML'] when the whole time it was supposed to be 'What's Next?' And the best part about releasing the ['What's Next?'] single is we're gonna do a whole campaign, because the lyrical content of the song is about the only thing certain is life and death, but what's next? So we're doing a whole campaign with the U.S. military — all the men and women of the U.S. Armed Forces, we're teaming together with them. We're gonna do a whole campaign to help out homeless vets, to help out guys with PTSD [post-traumatic stress disorder], all that stuff. We're just gonna do a whole thing for an awareness level, for a bit of an inspiration." He continued: "The whole concept of the ['1000hp'] record was, really, going back to the roots of Boston, and part of our history of that was we were, as people know, a big part of the Navy… We used to be… We were the recruit song for six years in a row. So we wanna kind of bring it back to that as well. And we're such big supporters of the U.S. troops. We don't support war — we wanna be clear about that — but we support our trops and what they have to do, and how they put their lives on the line for us every day so we can live in a country like this." "1000hp" sold approximately 58,000 copies in its first week of release to land at No. 3 on The Billboard 200 album chart. The disc, which arrived on August 5, 2014, followed up 2011's "The Oracle", which topped the chart with sales of 117,000 copies in its debut week. Erna described the sound of the "1000hp" album to The Pulse Of Radio as "a little bit more raw, a little bit more open. The writing was a little freer. The production is really kind of raw and in your face, and the songs, man — I'm really, really excited about these songs. And I have to tell you honestly, I wasn't that excited about writing this record at first."